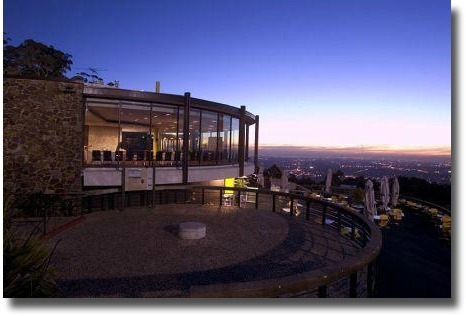 Experience Mt Dandenong's Sky High with the most incredible Melbourne city skyline views, top quality food and plenty to amuse the children. 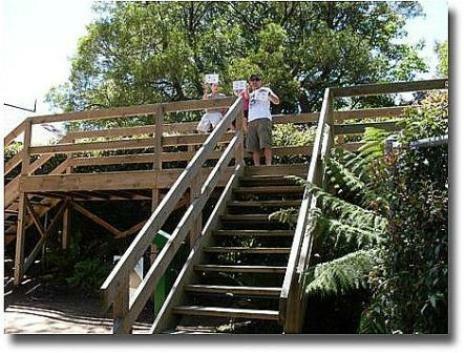 If you are into Melbourne sightseeing then this is one place you can't miss visiting. 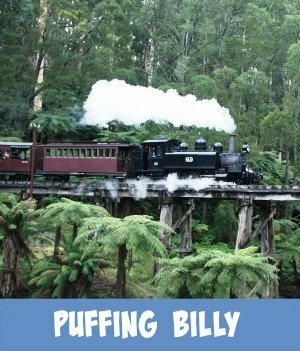 Only 45 minutes east of Melbourne city central you will find plenty of fresh, sweet smelling air and some really unique things to see and do right on top of Mt Dandenong. On a clear day the view is simply breathtaking. To really take advantage of this fantastic sight, check out the weather details for the day that you intend to visit. Try to have as clear a day as possible with as little smog around and then you will be able to look out over the magnificent City of Melbourne and it's beautiful surrounds, thoroughly enjoying the spectacle. You can see 180 degrees from the left, the Mornington Peninsular, across Port Phillip Bay, across the Melbourne city skyline and around onto the You Yangs and the start of the Great Dividing Range. 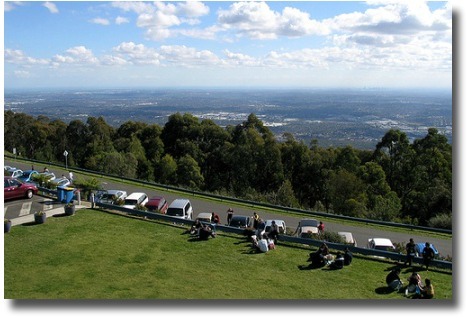 Where Is The Sky High Outlook On Top Of Mount Dandenong? There is a small entry fee to the site and then you are free to discover how beautiful this area is. 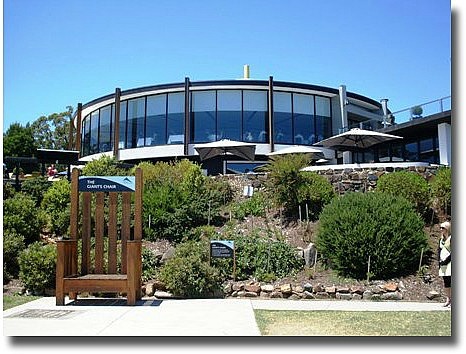 Reopened in July 2005, it has the new name of SkyHigh Mount Dandenong, it used to be called the Mount Dandenong Observatory. The actual building now has a fantastic, enlarged viewing window and Observation Deck. The weather Melbourne enjoys can be quite contrary so it is a good idea to check out the Melbourne weather forcast before you make your plans to visit. At the front of the Observation deck make sure to pose the kids for a great, memorable photo shoot sitting on the giant's chair. 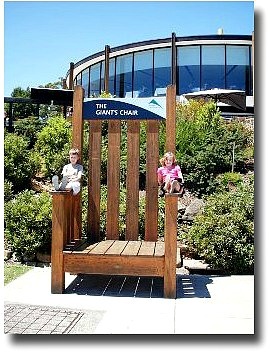 The Giant’s Chair is a large novelty wooden chair on the front lawn of the site. With plenty of tourists around, why not hop into the shot yourself and get one of them to capture the moment for you and your family. 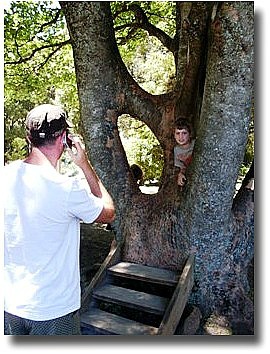 Looking back on the pictures that I captured years ago when I was up there, is still fun these days and the kids love to revisit the memory, they looked so little then. For some real family fun explore the Maze where you can wander through a beautiful formal garden filled with sculptures, illusions and butterflies. Become a Maze Master and find the 4 secret squares. There is a small charge for entry into the Maze. For more details phone (03) 9751 0443. Legend states that around 1900 before the area was cleared, Billy Langton, 4 years old, became lost. His Father arrived at this spot, sitting here he wished to find his son. On looking through the circle in the tree he saw his son squatting beside the creek! Look through and have a wish - never know it could come true. This Messmate Eucalypt Tree was struck by lightening some years back and now has been recycled in a most unique way. 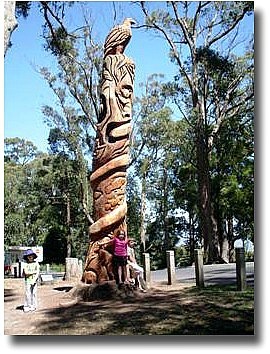 In 2006, the renowned artist Leigh Conkie turned the stump into an amazing piece of sculpture. 3 meters was lopped from the top and turned into the nearby chair. The actual sculpture is beautiful, very Australiana and well worth really looking closely at all the carving artwork. Get the kids to stand under the tree as it towers 20 odd feet up over their heads. Take pictures and store the memories of another great day out with your loved ones. The beautiful and unique art piece is situated close to SkyHigh's Maze you can't miss it. Have you thought of perhaps celebrating a special kid's birthday with a picnic party? use one of the free gas BBQ's and picnic areas within the surrounding grounds. 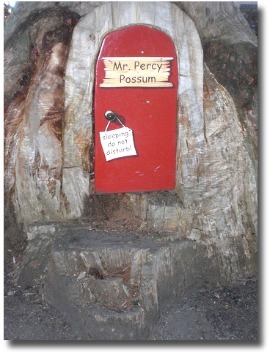 You could create a fantastic kid's party using Percy Possum's House as the base theme. 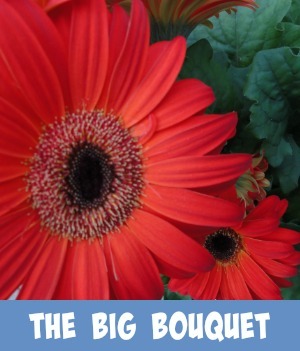 Get the kids to dress up in animal costumes and have a little "tea party" - what fun! Breakfast on Weekends - what a way to start the day. Or visit the Restaurant's website for more details. If you like the idea of a tour up here in the clouds why not take advantage of just sitting back and letting someone else do all the planning and organizing. 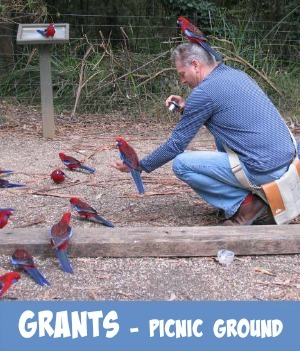 Mountain air, Australian Native Birds, rainforests and delicious wines and nibblies. Top places to stay with or without the kids.